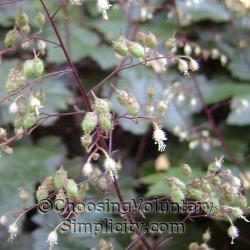 Growing heucheras from seeds you harvest yourself can be a very interesting project because most of the resulting seedlings will look very different from the parent plants. Even my ordinary green heucheras produce many different colored seedlings in a range of colors from red to orange. Some individual characteristics will not show up until the seedlings are at least two months old, but heuchera seeds planted in spring and kept under plant grow lights will be a nice size to plant outdoors in the garden when the weather warms up. Harvest heuchera seeds after the seed pods become dry but before the pods have opened. Heuchera seed pods are so tiny they are difficult to see, but it is easy to strip off the seed pods by running your fingers up the flower stalk. You will end up with a lot of fine dry chaff and seeds mixed together. I never try to separate them, although I do remove any large pieces of seed pod. Put this unimpressive-looking seed and chaff mix in paper envelopes until you are ready to plant the seeds. Store the envelopes in a cool, dry place. An ideal growing medium for heuchera seeds is an equal amount of a good seed starter mix and vermiculite or perlite. The perlite or vermiculite makes the soil mix lighter and more permeable and is really necessary if you want sturdy, healthy seedlings. Moisten the soil mix until it is damp but not wet. Heucheras will not thrive in a heavy, wet growing medium. 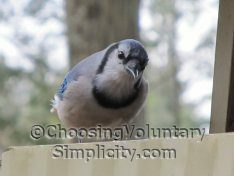 Fill your seed trays with the seed-starting mix and sprinkle the seed and chaff thinly and evenly over the top. Each little seed pod has a TON of seeds, so be careful and don’t overplant… you do not want to end up with thousands of little seedlings! Do NOT cover the seeds with more starting mix. Heuchera seeds need light to germinate, so all you need to do is to spray the surface lightly with water. Cover each seed tray with a clear plastic bag and put the bag and tray under plant grow lights. Don’t let the germinating seeds and soil dry out… if necessary, mist occasionally to keep the surface moist. Germination will occur in about ten days to two weeks. As soon as the seedlings appear, remove the plastic bag and start watering the trays from the bottom. Heuchera seedlings develop a long center root at a very young age, so they should be transplanted for the first time as soon as the seedlings have grown a second set of leaves. Continue to use the same soil mix with the added vermiculite or perlite and water seedlings from the bottom. As the seedlings grow, transplant them to larger containers as you would with any other seedling. Another option: try planting heuchera seeds outside in the garden in the fall. Sprinkle seeds over the soil surface… do not cover the seeds. Heuchera seedlings are surprisingly tough and many seeds will germinate, even when given this little attention. Thanks for the great information! This was exactly what I was looking for, keep up the gardening articles! thanks for the informationmy father grew many different kinds of heuchera for my mother as it was haer favaourite plant. My mother recently died and I decided to turn a part of my garden over in her memory by growing her favourite plants. The information you have given is excellant. Though I have bought the most common of the heucheras I wanted the unusal ones and now I know how to do them. Thanks for the direct sowing advice. It’s still terribly hot here in NorCal (100 today! ), but we also don’t have a terrible winter…so I plan to sprinkle out there next week & see what happens. That is a bright east facing bed that gets great light until about 1pm but then is just shaded under pine-like trees. I’m planting ‘Coral Bells’ and hope they pop up true to type, though I hear that is rare.